Hillside is in its 29th year, meaning that this annual festival is practically a way of life for those who live near Ontario's Guelph Lake Island, where the event is held each year. Now, the organizers have unveiled the much-anticipated lineup for the festival's 2012 instalment. 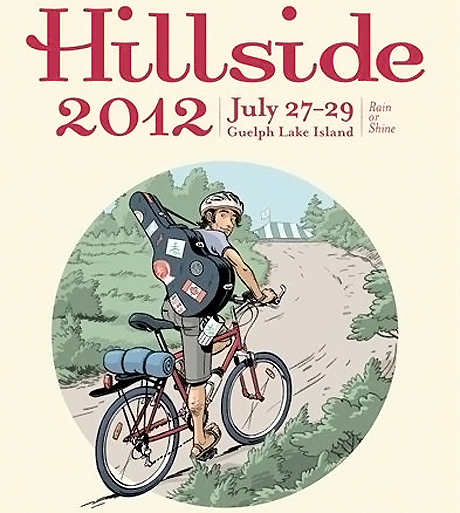 Some of the big names playing this year's Hillside, which takes place from July 27 to July 29, include Kathleen Edwards, Joel Plaskett Emergency, Chad VanGaalen, Elliott Brood, Great Lake Swimmers, Bahamas, Arkells, Rich Aucoin, Ohbijou, Memoryhouse, Jennifer Castle, the Wooden Sky, Zeus, Cold Specks, the Be Good Tanyas, Bidiniband, Bombay Bicycle Club, the Deep Dark Woods, Imaginary Cities, Sidi Touré, Keys N Krates, the Jezabels, Doldrums, and Bry Webb and the Providers. A press release notes that the festival "emphasizes diversity: of culture, of musical heritage and style, of age, geography and influence." Tickets go on sale May 5 at 10 a.m. local time and cost $115 plus tax for a weekend pass. As for individual day passes, they're $40 plus tax for the Friday evening, or $70 plus tax for either of the weekend days. Senior weekend passes are $57.50 plus tax, while kids 12 and under are free. Tickets will be available here here, or at one of the record stores listed on Hillside's website, where you can also see the full list of performers announced for the 2012 edition.